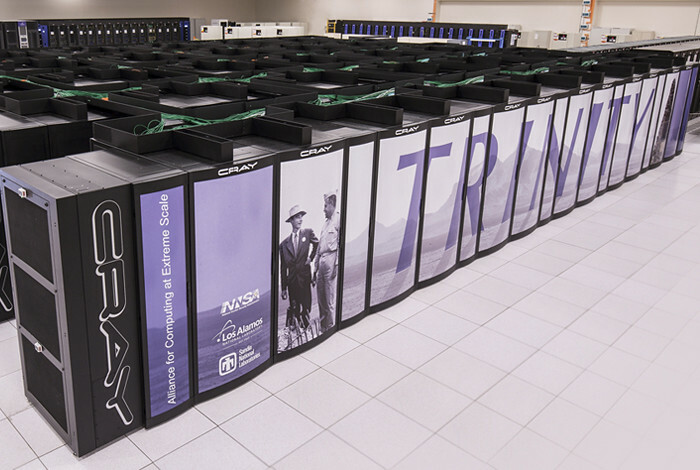 LOS ALAMOS, N.M., Nov. 16, 2017—The Trinity Supercomputer at Los Alamos National Laboratory was recently named as a top 10 supercomputer on two lists: it made number three on the High Performance Conjugate Gradients (HPCG) Benchmark project, and is number seven on the TOP500 list. The TOP500 approach does not define “supercomputer” as such, but uses a benchmark to rank systems and to decide on whether or not they qualify for the TOP500 list. The benchmark they use is Linpack, which means that systems are ranked only by their ability to solve a set of linear equations. Therefore, any supercomputer – no matter what its architecture is – can make it into the TOP500 list, as long as it is able to solve a set of linear equations using floating point arithmetic. The High Performance Conjugate Gradients Benchmark project is an effort to create a new metric for ranking HPC systems; HPCG is intended as a complement to the High Performance LINPACK (HPL) benchmark, currently used to rank the TOP500 computing systems. The computational and data access patterns of HPL are still representative of some important scalable applications, but not all. The HPCG benchmark is designed to exercise computational and data access patterns that more closely match a different and broad set of important applications, and to give incentive to computer system designers to invest in capabilities that will have impact on the collective performance of these applications.